Hello PinkWhen readers! I’m Teryn and I blog at Vintage Romance Style. Now that New Years is over and we’re chugging along to the end of January, it’s time to start thinking about Valentine’s Day if you already haven’t. 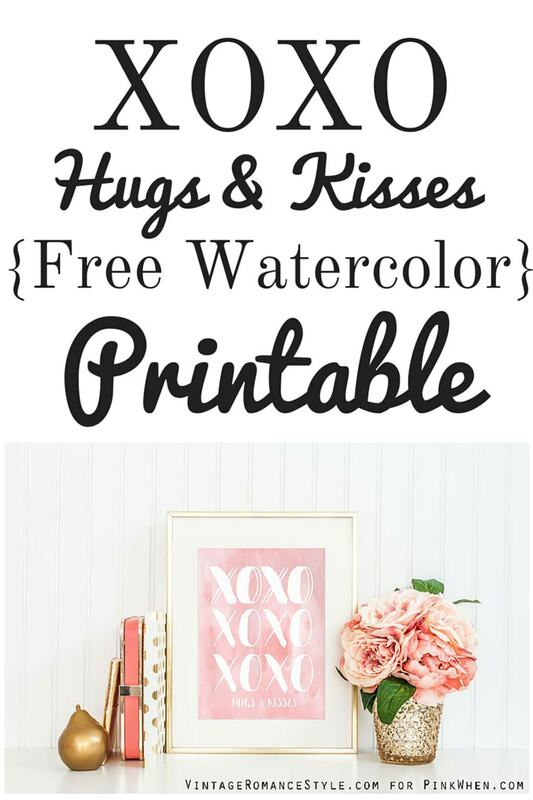 Today I am sharing with you a Hugs & Kisses Free Valentine’s Printable. Valentine’s Day is one of my favorite days. Not because I’m going to get diamonds or be whisked away on a jet set to Paris for a candlelit dinner ( a girl can dream right?) but because I get a day to make all things heart shaped for my children and give my husband a sweet card to remind him how much I adore him after all these years. It’s a day that should remind us of all the special people that are in our lives for a reason and that in fact, we shouldn’t let them know just how special they are only one day a year! Remind them often! 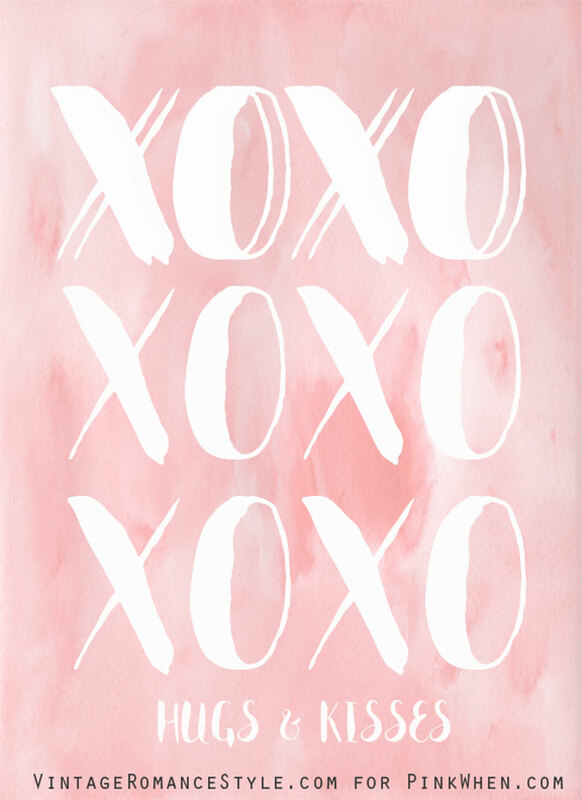 With love in the air, I want to share with you a love inspired printable. One thing that I love are printables when decorating for any holiday. They are so easy to change out of a frame and are definitely budget friendly. Absolutely free if you already have a printer full of ink and some paper laying around. I recommend printing on card stock if you have that. It will make your little piece of art look professionally printed. If you don’t have white card stock, you can find some at any craft store. A single piece is less than a dollar and you can buy it in bulk too! This is one of my favorite printables to date that I have created. I love the watercolor and how chic it looks. You don’t have to limit this one to just Valentine’s day! How cute would it look in a little girl’s room or bathroom? Don’t forget to check out other projects like my Restoration Hardware Knockoff Crystal Orb Chandelier , Recalimed Fence Wood Sign and Aqua Rit Dyed Drop Cloth Curtains.